Hi! I'm Kiki, a hair and makeup artist who runs a beauty blog, kikibabemagic.com. I first ordered from Krazy Essentials in April 2018 and immediately fell in love with my haul: Body Polish in Warm Vanilla, Body Butter in Wahala (currently discontinued till Fall 2018), Lip Scrub in Coco-Lime, and the lip treatment that's rapidly growing a cult following, the Overnight Renewal Therapy. Initially I used the products according to the directions and enjoyed the results. Then, since KE offers a LOT of product for a great value, I started testing the products out for other beauty needs with surprisingly great results. To be clear, I'm not a skincare expert, just an experimental enthusiast. Read on for my first Krazy Essential product hack that worked for me! When I first used the Krazy Essentials Lip Scrub, the first thing that struck me was the richness. My lips felt exfoliated of course, but also SO moisturized after using it for the first time. Why? The sweet almond oil, castor oil, and jojoba oil make for a rich blend with both emollient and occlusive properties. In other words, the almond and jojoba oils absorb into the skin quickly and the castor oil remains on the surface longer, so it can seal in hydration. Perfect! Now let's talk about how to use this product normally, before we move onto the hack. Note: Before you use the KE Lip Scrub or any new product, make sure to patch test on a small area to test for any reactions. If you're into Korean skincare at all, you're probably familiar with the oil cleansing method - if not, check out skincare guru Cave of Beauty's post on the topic! Basically you massage your face with oils, then you either remove the oils with a hot steamy towel or with a second cleanser. This second method is known as double cleansing. After using the KE Lip Scrub a few times, I wondered, "How would this work as a facial scrub?" My T-zone pores get clogged especially easily now that I'm in Bali, Indonesia, where I'm immersed in humidity, sweat, and scooter pollution. So I love the occasional physical exfoliant. I figured that since the sugar granules in the scrub start to dissolve as soon as you add water, it wouldn't be too rough on my slightly sensitive skin - unlike say, apricot scrub. So I removed all my makeup via my usual oil cleanse method, hopped in the shower, and scrubbed it up. What I found was... the scrub element felt great. Satisfyingly gritty, not rough or irritating at all. But my face was left with a slick coat of oil! So I ended up having to cleanse again just to get the oil off. Not what I was going for. Which led me to my revelation: What if I used the KE Lip Scrub *during* the oil cleansing process to remove makeup and exfoliate at the same time? The next day, I swapped out my oil blend for just KE Lip Scrub. I wet my skin, applied the scrub, and concentrated on my lips before moving onto the rest of my face. I focus on gently massaging to boost circulation, not scrubbing: I want rosy cheeks and no redness. Then, I rinsed to get the remaining sugar granules off and massaged the remaining oil into my eyes to dissolve my makeup. The rich oil was *perfect* for removing waterproof mascara! A huge plus. Then I double cleansed with Shikada cleansing wipes (which appear to be available only in Asia). My face looked and felt amazing! My skin was actually so moisturized that I had to wait for half an hour before my other products could even absorb. I love how my skin looks and feels when I cleanse with the KE Lip Scrub so much that I've incorporated it into my weekly routine. Let me know how it works for you if you try it! I'm excited to try steaming rather than double-cleansing next time. That's my first Krazy Essentials product hack! If you like this post, you can check out my beauty blog or hit me and Krazy Essentials up on Twitter to chat with us all things beauty related. We're both very active on Twitter and would love to hear from you. 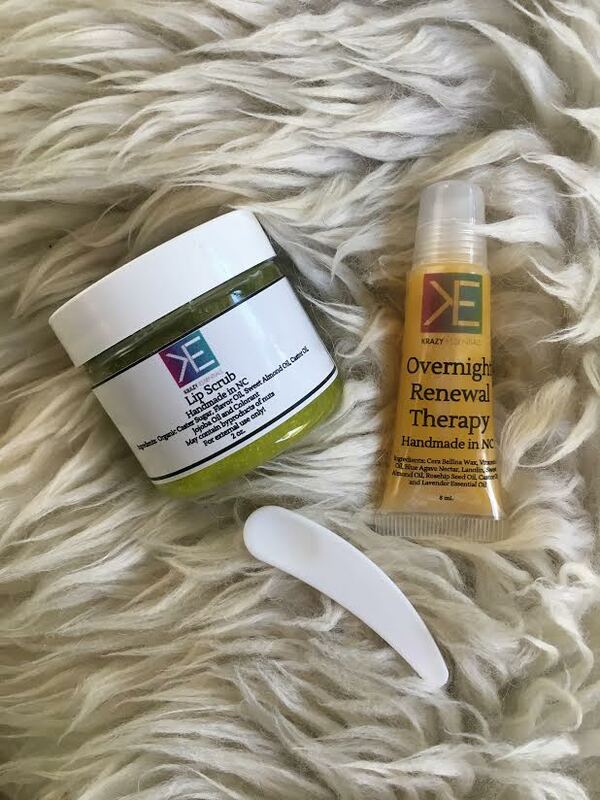 Stay tuned for my next post on my Overnight Renewal Therapy Hack (can you guess what it is?). If you're intrigued by my Krazy Essentials Lip Scrub hack and want to try it yourself, you can buy it here!